The morning air is crisp and light, smelling like fresh rain and new grass. The trees shake and rustle in the strong sea breeze as I walk towards the beach and the rising sun. Already, there are people fishing in the low tide. They stand waist-deep in the water, armed with a bucket and a small scythe-shaped tool meant for hooking and snagging small fish, octopus, squid and crab. These will later be used to flavour homemade soups. Small sail boats glide along the horizon as the sun's rays highlight the distant islets that mark the north coast of Mauritius. It is easy to see why people call this paradise - the beaches are pristine, the villas luxurious and the greenery lush. The Indian Ocean nation, about 2,000km off the south-eastern coast of Africa, celebrates its 50th anniversary this year. 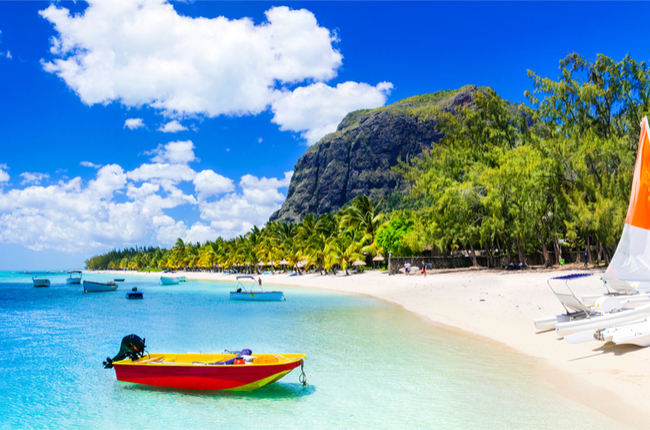 For travellers, Mauritius offers a comfortable duality. The five-star hotels offer top-notch service, a barrage of sea activities and mouth-watering cuisine that reflects the nation's mix of Indian, Creole, French and Chinese heritage. But woven through the modern amenities are threads of nature and wildlife that remain unaffected. Large herds of deer canter through perfectly maintained golf courses. A wild bulldog shark, which the staff have named Johnny Holiday, swims between the platforms of a floating restaurant that overlooks a lagoon. Outside the plush hotels, the buildings and homes become less fancy, reflecting the grittier streets of neighbouring towns. But the people here have a jovial and welcoming spirit that can be felt - whether you are getting a spa treatment in a beautiful seaside pagoda or buying a roti puri, or savoury pancake, from a streetside stall. Though there are resorts all over the island, each coast is a little different. The south is more remote and private, further from the city and closer to nature. Those who want adventure will enjoy exploring the mountains, biking or sailing. The north and east have more five-star resorts and sprawling golf courses and are closer to the capital city of Port Louis. After breakfast, we take a quick bus ride to the coastal village of Trou d'Eau Douce, past large sugarcane fields that are scattered across the island. A guide from tour operator Kreola (www.kreola.mu) walks us to the beach, where several catamarans have dropped anchor along the coast. We join a group of about 15 other smiling holidaymakers aboard a medium-sized craft that sets sail for the day to explore the east coast. The catamaran moves serenely through lagoon waters that cannot be more than 2m deep. The turquoise waves are crystal clear and I can see corals and sea urchins on the sea bed. While everyone sips on fruit juice, cold Mauritian beer or a glass of Coke and rum, I head to the bow to take in the view. There is enough space on the wide front of the craft for me to sit facing forward, with my legs dangling over the edge of the boat. On the open water, I get to see both the wide ocean horizon and the soft cloudy peaks of the green mountains that sit inland. It is completely relaxing. The smell of roasting meat wafts through the boat as a crew member starts to cook on a charcoal grill at the stern, singing catchy yet meaningless rhymes as he works. We are served a barbecue lunch of grilled chicken, fillets of blue marlin, pasta and toasted garlic bread. After the meal, the catamaran stops at Ile aux Cerfs, also known as Deer Island - a small patch of picturesque land where visitors can sunbathe, swim, snorkel, parasail and go on banana boat rides. Before we know it, it is time to head back to the mainland. We arrive back in the late afternoon, lungs filled with fresh sea air and hair tousled by the salty ocean breeze. The day trip costs about US$100 (S$137) and includes lunch and unlimited drinks. In the evening, we are taken to the Constance Prince Maurice hotel, a lavish resort on the north-eastern coast. We are to take part in a new dining experience launched at its award-winning wine cellar in June. It is a haven for wine enthusiasts. The well-stocked cellar has more than 1,250 types of wine and typically holds about 28,000 bottles. Tonight, we are to be treated to the Around World Wine Experience, a sumptuous dinner where the wines are selected before a chef creates a four-course menu around the beverages. The exclusive dinner takes place in the wine cellar itself. We walk past shelves of wine to the heart of the cellar, where a single table awaits us. The private space is warmly lit, but cold, so that the wine is properly stored. The waiters hand out shawls to keep us warm. Our meal starts with a champagne, Deutz's Brut Classic, paired with delectable salmon tartare canapes and seafood uramaki. This is followed by a white wine from Gilles Bonnefoy. The slight notes of passionfruit in the wine are complemented by a tempura prawn served with passionfruit cream. For the main course, we open a bottle of Le Dragon de Quintus, a lovely red wine from Chateau Quintus which is matched with juicy lamb chops topped with a savoury sweet glaze. All through the meal, a friendly sommelier, Nadia Periasammy, takes us through each wine, feeding us interesting tidbits about where the wines are from and pointing out the unique notes and flavours we should be experiencing. Her love of wine is clearly evident and her bubbly nature makes her passion contagious. We wrap up the meal with a sweet wine from Olivier Decelle paired with a trio of desserts - hazelnut mousse crunch, a Black Forest chocolate cup and a coconut eclair. It is a satisfying and extravagant meal and the dining experience is taken to another level through the interactions with the expert sommelier. I leave feeling warm - both from the many glasses of wine and a newfound appreciation of wine. As we take a slow stroll back to our hotel rooms, the sky is awash with stars - something you would never see in the brightly lit nightscape of a city. As grand and sophisticated as the accommodations and dining choices are in Mauritius, the breathtaking nature is truly what makes the island a paradise. • This trip was sponsored by Air Mauritius.